The plot of this story revolves around a kid named Sora. He lived on a peaceful island with his two friends Riku and Kairi. Unfortunately, he wakes up one morning to find that the ocean has turned to darkness and a tornado is ripping the island off the ground. Riku vanishes in the waves and Kairi also disappears. Sora tries to keep himself together, but then he also fades away. He wakes up in a mysterious town where he meets up with strange people who tell him that all of the worlds are connected…and dying. Sora shakes this off and meets up with Donald Duck and Goofy from the classic Disney movies. They explain that they are looking for King Mickey and were told to travel with Sora in the meantime. This is because Sora is the chosen Keyblade Master of destiny who will find the keyholes in all of the planets and restore balance to the universe. Sora gets his game face on and prepares for this endeavor, but it’ll be tougher than he dared suspect. It’s a pretty fun story that works well enough even if you switched out the Disney characters for made up ones. That being said, it certainly has more of an impact when you throw the crossover angle into the mix. It’s pretty fun to see the characters show up and help Sora out in each world. Sora gets to travel to Aladdin’s world, Peter Pan’s, Alice in Wonderland’s among others. It can be pretty nostalgic to see them and while those characters can’t fight all that much, Sora doesn’t really need any help. As I mentioned earlier, the one drawback to this novel is that the fights are very short. Most of them are over in a couple of hits and don’t usually last more than a couple of pages. Some of them seem to be over in a single page. I hope we can get some longer fights in future adaptions, particularly Kingdom Hearts II since that should have quite a lot of fighting in it. I don’t mind if they have to skip a few worlds as a result, the action will be worth it. Sora’s a likable protagonist and a good kid. He loses confidence a little too easily at times which is his main character flaw, but I’ll certainly take that one over most. He seemingly gets over this by the end of the novel, but it’ll be difficult to say for sure until we actually get there. There are quite a few plot twists and villains who like their mind games coming up so that could rattle Sora quite a bit. I didn’t like Donald or Goofy though. They showed their true colors when they chose to leave Sora after the keyblade vanished. Friends shouldn’t just leave each other so easily. While they eventually went back to Sora’s side, it feels like he can’t really trust them as much as he thought. That test of loyalty was one that they failed. It’s not as if they’re great fighters either. Goofy’s shield and Donald’s magic will never be quite as effective as Sora’s sharp keyblade. It’s just the ultimate weapon. Riku also shows up and part of the drama with him is that he has been tempted to the dark side. He thinks Sora is having too much fun as he goes on side trips while Kairi is still in a coma. Riku decides that he’ll have to save her on his own and goes through a lot of dangerous quests to get to this point. The darkness starts to overwhelm him by the end though and he loses sight of his goals to an extent. With his character arc coming full circle as Sora convinces him to join the light once more, he should make for a good ally in the coming volumes. While he may have had a point initially with Sora, he was also pretty unfair about it since Sora did try to find Kairi and just failed to do so. Riku had the advantage of having an evil witch on his side….if you can call that an advantage. Maleficent is one of the big villains here, but her role is greatly reduced from the game. She gets to appear a few times, but comes across as an underling who was being used the whole time. Unless she redeems herself in the sequels, I’m going to say that the author probably wasn’t a big fan of hers. Ansem shows up at the end of the novel as a fun final boss and he makes for a good opponent. We certainly haven’t seen the last of him. Once Organization XIII shows up, it’ll help the series as it will finally have recurring villains who will last for a very long time. This novel is of a pretty good length so it should last you a while. It’s about 300 words and the font isn’t all that big either. A lot of stuff happens over this time and as I mentioned, the book was able to fit in a lot of worlds. Each of the Disney worlds gets a good amount of screen time. While the Beast may have only gotten to appear without his world, he still looked pretty good since he was able to follow Belle when all of the other main heroes failed to do so. Following someone through a portal is rare no matter what medium you’re in. Characters just tend to hesitate a little too much when the going gets tough. Overall, It’s fun to revisit the original Kingdom Hearts story and to finish another book in general. It’s been a long time since I played the first title so this is always nostalgic. I remember the series very well so it’s not as if it’s new to me, but it is fun to see how the series was before the deep plot started. Make no mistake, the seeds had sprouted for the plot with hintings all around. The writers likely had a good portion of the sequel all planned out and that’s one of the fun things about the franchise. It’s all connected and you always feel like it’s planned out well. I’ll be reading the sequel right away, but it’s a lot longer than this one so it could take a while to finish. I definitely know it’s going to be fun as well and it may even be better since Chain of Memories had a more engaging plot with higher stakes than this one. If you haven’t played the game, I highly recommend reading this book to get you into the franchise. Alternately, you should take the plunge and finally buy the original game. 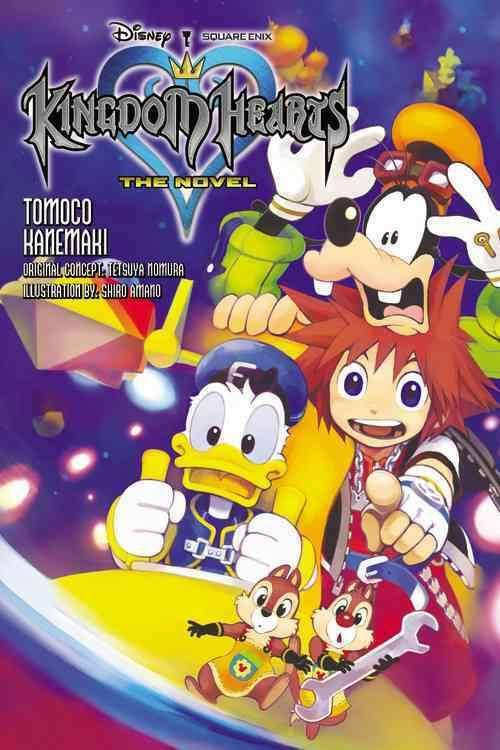 This entry was posted in Book Reviews, Books, Reviews and tagged Book, Book Review, Crossover, Donald Duck, Final Fantasy, Goofy, Kingdom Hearts, Novel, Review, Sora by dreager1. Bookmark the permalink. I had put this on my low priority list since I heard reviews were mixed, but I just got a review copy. So I guess we’ll see! More optimistic now after your review.